Here’s another of the over 400 arches found in the Aztec arch area, near the town of Aztec in New Mexico. It’s a small one, off on the right. You can get a brochure that will tell you how to take several self-guided tours. The two tours we went on were no problem for our passenger car. But if you go, keep an eye out for sand and ruts in the road. 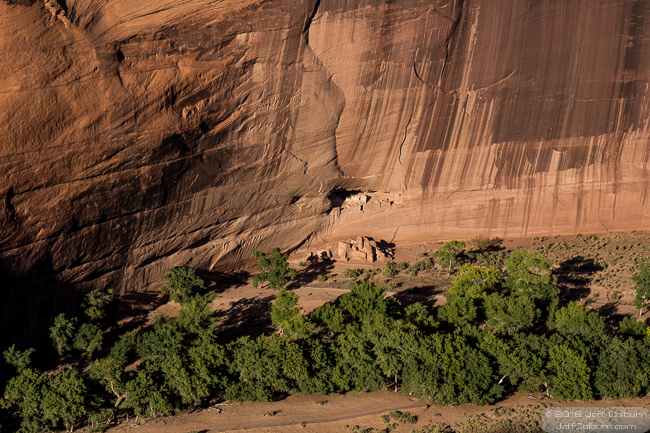 These are the White House Ruins at Canyon de Shelly, Arizona. The geology at Canyon de Shelly is really amazing. 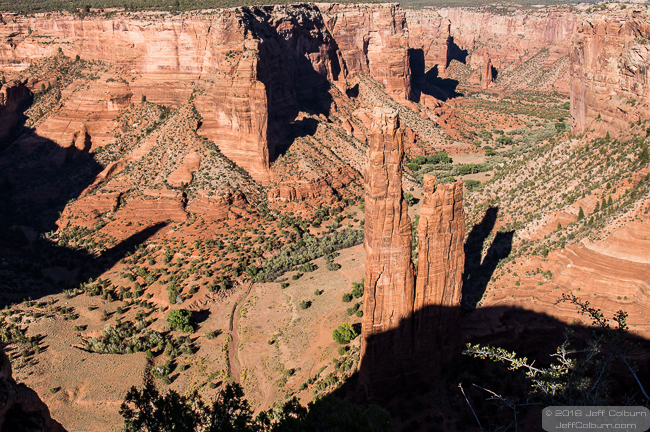 This 830 foot (253 meter) rock spire is Spider Rock at Canyon De Shelly. Spider Woman is supposed to live in the crack between the two rocks. Every day she comes out, casts her web and catches naughty children and eats them. Kind of a Boogyman on steroids. On a brighter side, she taught the local Native Americans how to weave. It really is an amazing site to see in person. 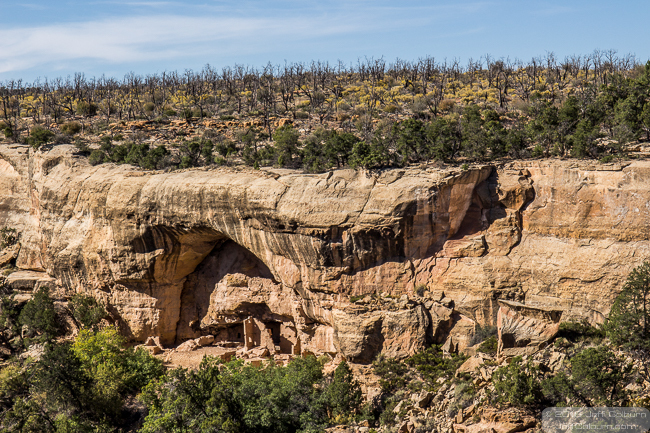 Here’s one of the over 400 arches found in the Aztec arch area, near the town of Aztec in New Mexico. You can get a brochure that will tell you how to take several self-guided tours. The two tours we went on were no problem for our passenger car. But if you go, keep an eye out for sand and ruts in the road. One of the nice things about the Salmon Ruins (www.SalmonRuins.com) is that they are in the town of Bloomfield, so they’re easy to get to. No driving on washboard dirt roads, and no chance of being featured in one of those, “What they did wrong that had them lost in the desert for two weeks” television shows. When you pay for admission, be sure to borrow a copy of their guide. It’s about twelve full sized pages and filled with a huge amount of information on everything you will see. If you are any kind of history buff, you will love all of the information in the guide. After you leave the museum and walk down the ramp to the ruins, you’ll see that the area is rustic. You’ll be walking on dirt. There are no paved walkways as some ruins have, but there is a trail to follow. Start off by going to the left to explore the Pioneer Homestead area. Here you will see several small structures that early pioneers built for themselves and their ranch hands. There’s a pioneer home, bunkhouse and small houses for the ranch hands. As with most things back then, they are small. The houses for the ranch hands are really one small room. I’m always amazed how, in about 100 years, we’ve gone from this to a couple feeling they have to have a 2,000 to 3,000 square foot house on five acres of land, just for the two of them. 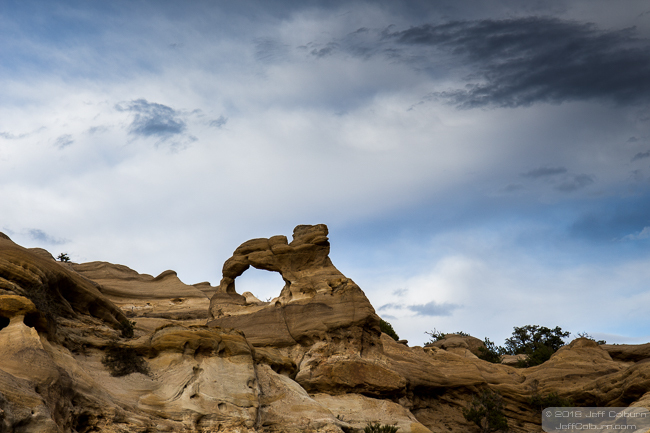 Around these pioneer structures you will also see a couple different kinds of kivas that the Indians made, and simpler structures made of sticks, branches and animal hide. Once you’re done in this area, head on over to the Ruins. 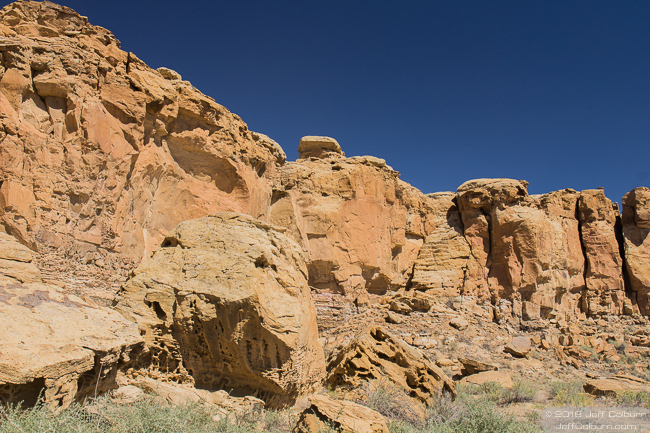 In the late 11th century, people from the Chaco Canyon area came here and built the Salmon Ruins. After they left, other Native Americans in the area used the site. In the late 13th century, the Ruins were abandoned for the last time. Nothing was done with the Ruins until archeologists started studying them in the 1970’s. You can walk into some of the rooms, which is a great way to get a close-up view of how they built the walls, and what it feels like to live in the rooms. Imagine living here, and how it would feel to have a bedroom and living quarts combo that’s probably the same size as the bathroom in your home. 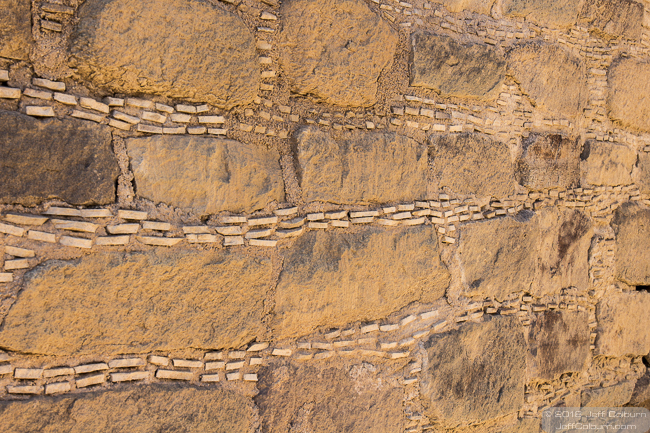 The small stones were a building style used by the last inhabitants. While you’re here, be sure to check out their gift shop and museum. They also have something you don’t often find, a research library. If you need historical information about the area, this is the place to go. I highly recommend that you visit the Salmon Ruins. It really gives you an accurate idea of how people lived so many years ago. Have you been here? What would you like to tell my reader about this location? Following are some of my favorite Holiday music videos. You’ll find the entire spectrum from traditional to shall we say, unique. I hope you enjoy them. Lindsey Sterling, an amazing hip-hop violinist with some great moves. Listen to her perform Carol of the Bells, What Child Is This and Silent Night. Next is Pentatonix, an acappella group whose voices blend beautifully. Listen to their versions of Hallelujah and Little Drummer Boy. I’ve always been a big fan of Jewel’s music and poetry, and was fortunate enough to see her in concert once. Listen to her amazing voice as she sings Ave Maria. There’s always someone who thinks Christmas us just a bunch of Bah Humbug. This video is for you. I hope you enjoy Carol of the Old Ones. My favorite irreverent Christmas song is The 12 Pains Of Christmas. Have a listen. Karen Carpenter was an amazing singer, and left us all far too soon. Listen to Merry Christmas Darling by The Carpenters. I’ve always liked Gloria Estefan’s voice and music. I was even a member of the Press when she dedicated her statue to the Wax Museum in Buena Park, California. I have some great pictures of that event too. Christmas is more than presents and parties. It’s about reaching out to those in need,righting the wrongs in the world and putting the Christmas Spirit in all we do,all year long. In this video you’ll see wrongs that need to be righted, and successes that have been achieved. We can all do something, big or small, to help others. Go out and help others. Hear Silent Night by Gloria Estefan. Many years ago there was a great Christmas special called “A Claymation Christmas.”It shows the amazing things that can be done with this form of animation. I hope you enjoy these videos, and remember, it’s all done with clay. Rudolf The Red Nosed Reindeer and Joy To The World. Another great piece of Christmas music is the Christmas Canon by the Trans-Siberian Orchestra. Is it really Christmas without hearing Madonna sing Santa Baby? And finally, if you think you have a great light display on your house, check out this and this one too. Have a Great Holiday Season! Party on!!! Every year on our wedding anniversary my wife, Linda-Ann, and I take a week-long trip somewhere. This year we went to the Four Corners region of Arizona, New Mexico and Colorado to visit ancient Native American pueblo ruins. One place we visited was Mesa Verde in Colorado, https://www.nps.gov/meve/index.htm. There are some amazing ruins here. You can get a ranger-guided tour through some of them ($5 per person and tickets must be purchased in-person), a self-guided walking tour to some areas and a self-guided driving tour. You want to check when these ruins will close for the season. Two ruins closed three days before we left on our trip at the end of September, and the other ruin closes from about mid-October through mid-April, due to snow. Spruce Tree House is closed due to rock fall danger. This is usually a self-guided tour. Some stabilization needs to be done to the rock face before people will be let in again. I’m guessing that it will probably be closed for at least another year as the stabilization process hasn’t even started yet. The easiest way to see as many ruins as possible is to drive along the three roads in the park and stop at the overlooks. It’s usually an easy walk from where you park to the overlooks, and you will get some great views. But you will need a long lens if you want close-up photos. We chose the Mesa Top Loop driving tour as it let us see the largest number of ruins and pit houses. It’s amazing to me that between 600 A.D. and 1300 A.D., the Native Americans were able to build and live in these pueblos that were stuck on the side of cliffs. 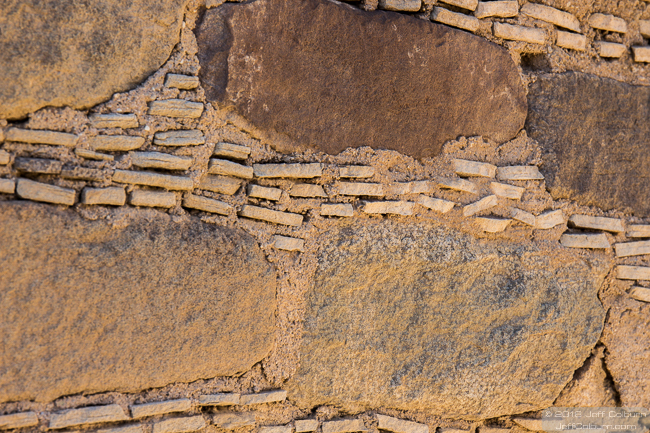 Carrying rocks, sometimes from miles away, and adobe to build their homes was incredible enough. 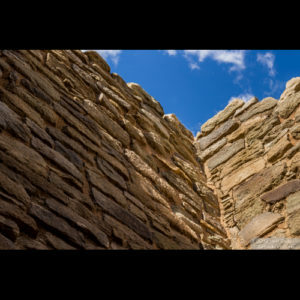 But then having to climb up or down to the pueblos every day for food, water and other supplies must have kept them in amazing physical condition. Archeologists have found about 5,000 Ancestral Puebloan sites in Mesa Verde. About 600 of these are cliff dwellings. 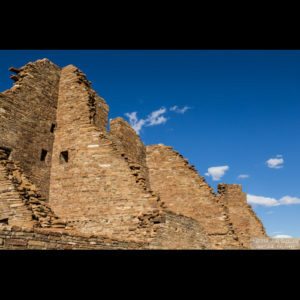 By about 1300 A.D., almost all of the Native Americans living in the pueblos had left, for reasons unknown. Here are some of our favorite pueblo ruins. Pit Houses – I have seen some pit houses around Arizona, and they are pretty small. Some aren’t much more than a shallow pit that one person could lay in. But the pit houses here were huge, and intricate. They were deep, had ventilation shafts, and some pits were connected with tunnels. Square Tower House – This is a smaller pueblo. You can easily see the four-story, 80 room, square tower in the pueblo. There is a spring below the alcove that supplied the residents with water for drinking and other uses. 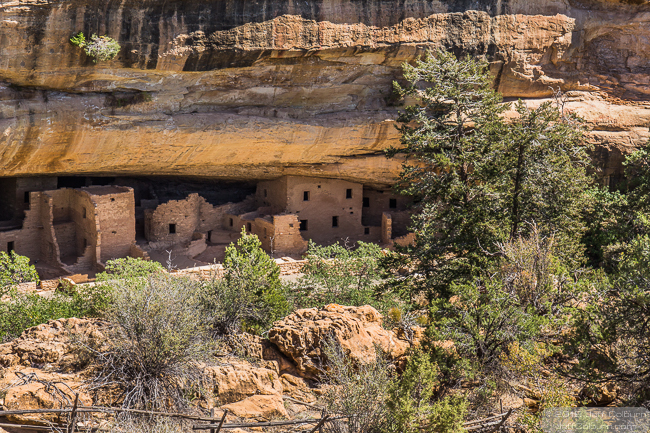 Spruce Tree House – This is the third largest cliff dwelling in the park, with 120 rooms, and it’s the best preserved. Besides living quarters, there are ten rooms used to store food, including: corn, beans, squash, wild onions and pinon nuts. Stone slabs sealed the doors to these rooms to keep out rodents and rain water. Cliff Palace – (We also went to the Cliff Palace Loop to get a closer view of these ruins.) This is the largest cliff dwelling in North America. It contains about 150 rooms, 75 open spaces and 21 kivas. An estimated 100-120 people lived here. Some of the buildings are four stories high. By driving from overlook to overlook, we saw many of the pueblos at Mesa Verde. If the main pueblos weren’t closed, we would have gone on at least one hike into them. Some of the pueblos are an easy hike, others are more difficult. 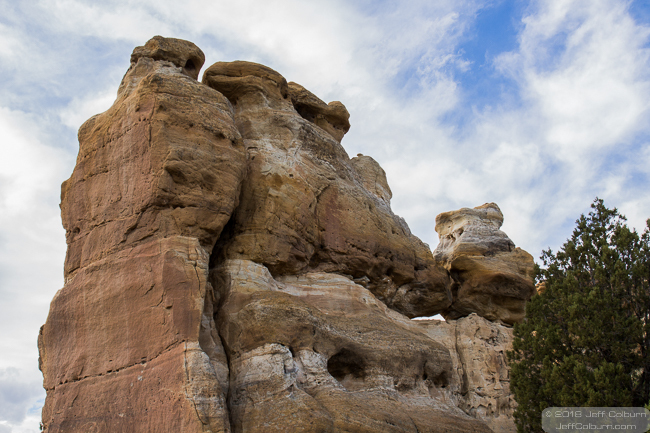 Choose the type of tour that works best for you, and enjoy the beauty and wonder of Mesa Verde National Park.